The Crankbrothers Opium C Direct Headset 1 1/8 Black/red is no longer available, although you may find similar or newer versions below. The same team that brought you the Mallet and 5050 pedals have turned their attention to headsets. The Crank Brothers Opium C Directset omits the standard headset cup and replaces it with flanges incorporated directly onto the bearing itself. The Opium C Directsets outer races are formed from 52100 bearing steel with a black finish. Its good looks cover some thorough engineering though. 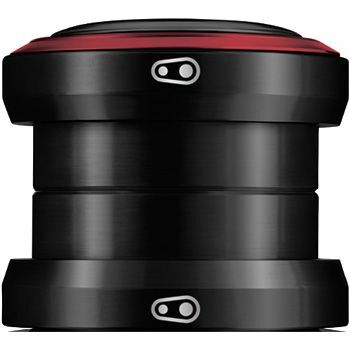 It features custom made 34 ball full complement (max) bearings both top & bottom. For Downhill racing nothing else will do. Crank brothers are so confident in the strength of this design that they offer a full 5 year warranty on the bearings in all of their Directsets.